NASA’s next Mars spacecraft has arrived at Vandenberg Air Force Base, California, for final preparations before a launch scheduled in March 2016 and a landing on Mars six months later. Lockheed Martin Space Systems, Denver, built and tested the spacecraft and delivered it on Dec. 16 from Buckley Air Force Base in Denver to Vandenberg, on the central California Coast. Preparations are on a tight schedule for launch during the period March 4 through March 30. The work ahead includes installation and testing of one of the mission’s key science instruments, its seismometer, which is scheduled for delivery to Vandenberg in January. 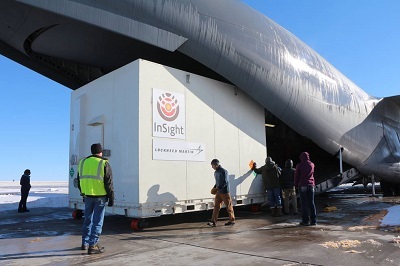 “InSight has traveled the first leg of its journey, getting from Colorado to California, and we’re on track to start the next leg, to Mars, with a launch in March,” said InSight Principal Investigator Bruce Banerdt, of NASA’s Jet Propulsion Laboratory, Pasadena, California. The seismometer, provided by France’s national space agency (CNES), includes a vacuum container around its three main sensors. Maintaining the vacuum is necessary for the instrument’s extremely high sensitivity; the seismometer is capable of measuring ground motions as small as the width of an atom. A vacuum leak detected during testing of the seismometer was repaired last week in France and is undergoing further testing. InSight’s heat-probe instrument from Germany’s space agency (DLR), the lander’s robotic arm and the rest of the payload are already installed on the spacecraft. InSight, short for Interior Exploration using Seismic Investigations Geodesy and Heat Transport, is the first Mars mission dedicated to studying the deep interior of the Red Planet. This Mars lander’s findings will advance understanding about the formation and evolution of all rocky planets, including Earth. One of the newest additions installed on the InSight lander is a microchip bearing the names of about 827,000 people worldwide who participated in an online “send your name to Mars” activity in August and September 2015. InSight will be the first mission to Mars ever launched from California. The mission is part of NASA’s Discovery Program, managed by NASA’s Marshall Space Flight Center in Huntsville, Alabama.